This freestanding menu case is strong, durable, very competitively priced and manufactured to order and delivered within 10 to 14 working days. The Freestanding menu case is available in a range of material finishes. 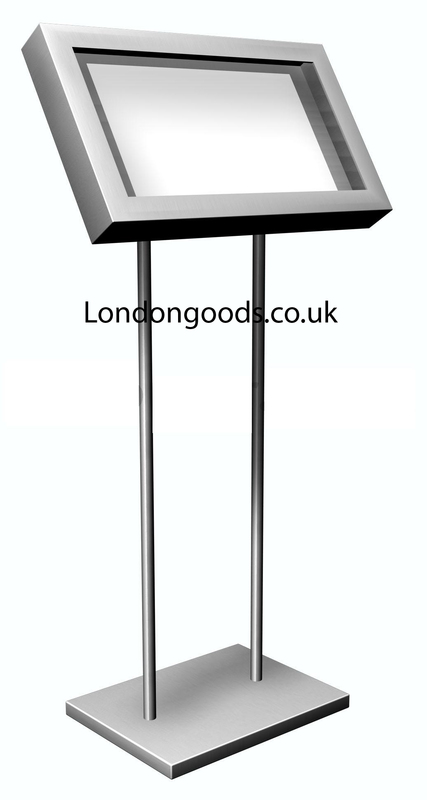 The visage menu case is illminated with a T5 8W Fluorescent lamp, non-illuminated available. The display area houses an A4,A3,A2,A1,A0 size menus depending on size chosen. 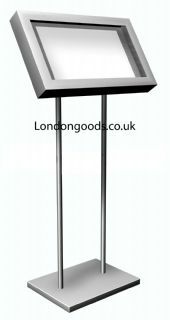 The case can be mounted in either a landscape or portrait format on the freestanding legs base. Easy access is gained via a hinged, barrel-locked, frame. Stand - 1400mm from floor to top of menu case. Available finishes : Black, Silver, Brass & Polished Steel. Brass - stand in black, Brushed/Polished Stainless Steel - stand in stainess steel, Black - stand in black, Silver - stand in silver. This item is manufactured to order.